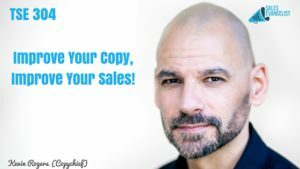 TSE 304: Improve Your Copy, Improve Your Sales! Home » TSE Podcast Post Page » TSE 304: Improve Your Copy, Improve Your Sales! We all need to know how to write effectively, even in sales, now more especially because of the social selling opportunities brought to us by LinkedIn or other blog posts and sites. Therefore, it puts you to great advantage as a seller to be able to deliver your message effectively through copywriting. Today’s guest is Kevin Rogers. He is a copywriter, spending 10 years as a freelance copywriter doing mostly on launching information products as well as in the health wellness space. He now runs a community of copywriters and business owners coming together to work and solve each other’s copywriting headaches. Kevin leaves us with a great lesson here today – that when you give value, money comes back to you. Positioning himself as a teacher, having written the #1 sales letter on ClickBank, a marketplace for digital information products, teaching people how he got to that level. Putting up the annotated report of the sales letter and distributing it around his community which generated great reviews. Treat your best knowledge the same way you should treat money. It needs to flow. When your instinct is to hold on and recognize that it’s happening out of fear and scarcity, do the opposite and you’ll be shocked at the results.